Eurobricks member and LEGO Fan Jonathan Gilbert a.k.a Shmails in flickr built this beautiful hangar diorama for the Andromeda's Gates Challenge of Eurobricks.com. This MOC takes the third place in the event but was really successful in terms of interior design in my opinion. The minifigure choice and good posing of them makes the creation seem like a scene from a sci-fi movie. With its studless design it has a very clean look. 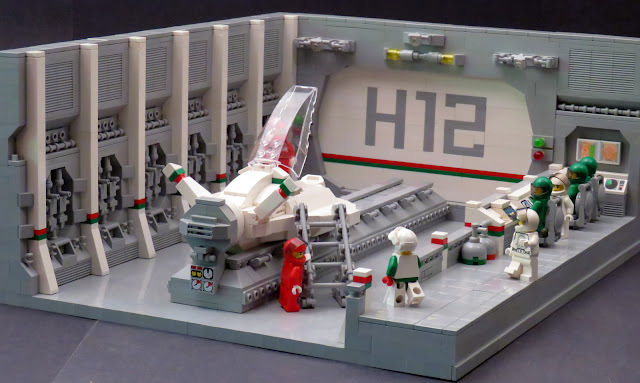 LEGO lover Sci-fi fans know very well that its usually hard to archive proper interior design using bley color building walls. Proper texturing is very important to build a "sci-fi" wall and make it different than a castle wall. The creator done a very good job building hangar wall on the left appropriately with the theme. Another interesting point is the letters on the hangar door which are created using plates.